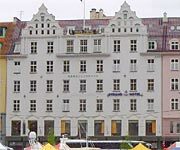 Hotel description: Strand Hotel Bergen is right in the centre of Bergen, just a few metres from the fish market at the end of the main harbour, with views of many of the famous sights. 88 rooms on 6 floors, cognac and cocktail bar, sauna, solarium, fitness room, sun terrace and lobby shops, plus conference facilities for up to 90 people. Built in the 1920s, the hotel has been extensively renovated in the last few years. An evening buffet meal is available Monday-Thursday outside the summer season.